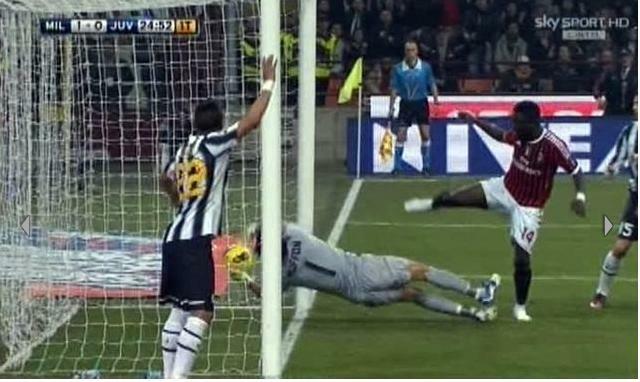 Clear-as-can-be still shot from Sky Italia showing that Sulley Muntari's header in the AC Milan v Juventus match did cross the line. Also shows that the linesman should have had a clear view of it. At the England-Wales rugby, they were willing to wait several minutes to sort out whether a try had been an, er, touchdown. Would 30 seconds to sort out whether this was a goal have disrupted the flow so much? Photo via the world's best sports newspaper, La Gazzetta dello Sport. If you follow the Middle East, you read all over the place 2 weeks ago that two Iranian naval ships had stopped in Jeddah, Saudi Arabia, on the way to the Mediterranean. AFP: Iranian naval ships docked on Saturday in the Saudi port city of Jeddah on a mission to project the Islamic republic's "power on the open seas," the Fars news agency reported. The supply ship Kharg and Shaid Qandi, a destroyer, docked in the Red Sea port in line with orders from Iran's supreme leader Ayatollah Ali Khamenei, it quoted navy commander Admiral Habibollah Sayari as saying. "This mission aims to show the power of the Islamic republic of Iran on the open seas and to confront Iranophobia," he said, adding that the mission started several days ago and would last 70 to 80 days. BBC: Iranian warships have entered the Mediterranean Sea for only the second time since the 1979 revolution. The destroyer Shahid Qandi and its supply vessel Kharg have passed through the Suez Canal but their destination remains unclear ... The ships were reported to have docked earlier at Jeddah in Saudi Arabia. First: On 18/01/1433H., the Iranian officials at the Embassy of Islamic Republic of Iran in Riyadh submitted through official channels a request for allowing two ships (Kharg and Naghdi) and a helicopter affiliating to the Iranian Naval Forces to dock at Jeddah Islamic Port during the period of 1-7/02/2012. The docking comes within a training tour for students of the Iranian Navy and within the framework of friendly visits. Such docking was approved by Saudi authorities. Second: The Iranian officials at the Embassy of Islamic Republic of Iran in Riyadh submitted another request for allowing Bandar Abbas Ship, Alvand Ship, Alborz Ship and a helicopter to dock at Jeddah Islamic Port during the same period. These ships replace the two ships that have already requested to dock at Jeddah Islamic Port (i.e., Kharg and Naghdi). The purpose of such docking is part of a training tour for students of the Iranian Navy, rather than what has been stated by the Iranian Navy Commander Admiral Habibollah Sayyari who said the purpose of this visit is to communicate with the countries of the region, render false any Iranian threat, and show his country's capabilities in international waters and foreign ports. These approvals come within the framework of a long tradition of naval forces throughout the world, allowing passage and docking within international conventions. Thus, the two ships cited in all the media reports did not stop in Jeddah, perhaps because the dwindling number of professionals in the Iranian Navy saw a conflict between the ships' later sabre-rattling mission to Syria and the use of traditional goodwill on the seas to get a stop in Jeddah. Other ships were sent on the original training call, but one Iranian clown couldn't resist a little buffoonery regarding the originally scheduled visit. Next thing you know, it's "news." Today reports emerged that problems with GPS synchronization could explain away the anomalous neutrino velocities, although specific details have yet to be confirmed. ScienceInsider s Edwin Cartlidge reported that a bad connection between a GPS unit and a computer may be to blame but cited only anonymous sources familiar with the experiment. Settled science is ready for its apology. BAGHDAD, Feb 22 (Reuters) - Two Islamist militant groups in Iraq have rejected a call by al Qaeda to aid Syrian rebels in their revolt against President Bashar al-Assad, saying sending weapons and fighters across the border would only worsen the conflict. Sunni Islamist al Qaeda leader Ayman al-Zawahri has backed an increasingly violent revolt against Assad, who is from an offshoot of Sh'ite Islam, and is fighting to maintain his grip on 12 years of autocratic rule in mostly Sunni Syria. The Islamic Army in Iraq, composed of Sunni Arabs and former Iraqi army officers, whose aim was to end U.S. military presence and influence in Iraq, said it would support the Syrians morally in their fight against Assad, but would not dispatch fighters. "We are against sending fighters, money and weapons to Syria ... we are waiting for the Syrian people to decide their fate but we are supporting their aspirations morally," a senior leader, who declined to be named, told Reuters on Wednesday ... The Islamic Army leader accused al Qaeda of trying to "steal the revolution" and said if armed fighters were sent, Assad, who blames foreign-backed terrorists for the nearly year-old unrest, would use it as a pretext for his crackdown. "We do not want to interfere so as not to allow anyone to steal their revolution as al Qaeda has done. We don't want to give the regime a pretext that can be used against the rebels," he said ... Sheikh Khalid al-Ansari, a senior leader with the Islamist militant al-Rashideen Army, said his group supported the fall of Assad but warned that arming Syria's opposition would create an increasingly sectarian conflict. "We support the Syrian revolution 100 percent and the fall of the Assad regime," Ansari told Reuters. "But we do not accept sending weapons, money and fighters to Syria because this will lead to the creation of a sectarian war that will target innocent people similar to what happened in Iraq and we do not want to repeat the same experiment." Yes these are militant groups. But they calculate their odds, anticipate how their participation will affect the overall situation, and they learn. That's not the usual portrait of these groups. It's always tough to read the body language in a still photograph but German finance minister Wolfgang Schäuble in his interactions with Greek PM Lucas Papademos and finance minister Evangelos Venizelos does not look like someone who just lost a battle to shove Greece into default, as the Daily Telegraph claimed. Photo from the European Council meeting today. Some terrorism experts expressed caution about what they called a rush to judgment. Will Hartley, the editor of Jane’s Terrorism and Insurgency Center in London, said in an e-mail, “The attacks in India, Georgia and now Thailand have all been highly amateurish, and lack the sophistication that would normally be expected from an operation” by either Hezbollah or Iran’s external operations wing, the Quds Force. The problem with this is that "amateurish" is an ex post concept. The attacks failed, hence they were amateurs. There was another bunch of amateur terrorists who made fools of themselves at strip clubs, got pulled over by the police, landed a light plane on a main runway at Miami, and made unduly complicated itineraries for themselves on their final escapade. That would be the 9/11 hijackers. But since they murdered 3000 people, nobody thinks of them as amateurs. And anyway, if Iran was professional, it wouldn't have attached itself to a psychopath like Bashar al-Assad and his clan in the first place. From which they need a distraction, so they send out the clowns in Thailand, Azerbaijan, and India. The first mention gets his name right but this clearly was an accident because then we get to "Prince bin Talal" which means just Prince Son of Talal. Talal (the famous "Red Prince") has a lot of sons. The 3rd mention repeats the error. bin Talal is not his family name. That would be al-Saud. But there are even more al-Sauds. Thousands of them. Prince Alwaleed works fine. Again the issue here is not being picky over the right version of someone's name. It's that if you're claiming an expertise in source texts that are in Arabic, you need to exhibit some rudimentary understanding of the most basic features of the language i.e. its structure of names. So with Russia having threatened, allegedly, to nuke Qatar for being such a pest over their Russia-China-Iran backed Bashar al-Assad, isn't it time for the Qataris to tell us what really went on with the Russian ambassador to Qatar last December? What did he not want going through the X-ray machine in Doha? With deep regret and outrage, the GCC member countries are closely following the increasing rhythm of killings and violence in Syria in what could be described, in its least terms, as collective massacre against the unarmed Syrian people and the demonstration of the Syrian regime's brutal acts against children, the elders and women as well as no respect for human rights or humanitarian ethical feelings, the statement issued by the GCC presidency [Saudi Arabia] said. The GCC countries suggest that the Arab countries ought to meet at the Arab League next week to take the necessary decisive measure to stop this dangerous escalation against the Syrian people after nearly one year of illusive tactics without any glimpse of hope in the offing, the statement added. The GCC member states express profound pain and regret for the killing of innocent souls and the infliction of great sacrifice on the people of Syria as their governing regime was not defending the country against an external aggressor but, in fact, running a power-conflict game that never cares about the Syrian peoples dignity or freedom. When the model is Chechnya, it's going to make the Saudis look good. What did George Bush see in Vladimir Putin's soul? Photo of Bashar al-Assad and Sergei Lavrov by SANA/Reuters. So how that's new BRIC world working out for ya? Remember when investment bank research houses wanted us all to be excited that the traditional global powers were being replaced by a rising group of large middle income resource-rich industrializing countries? 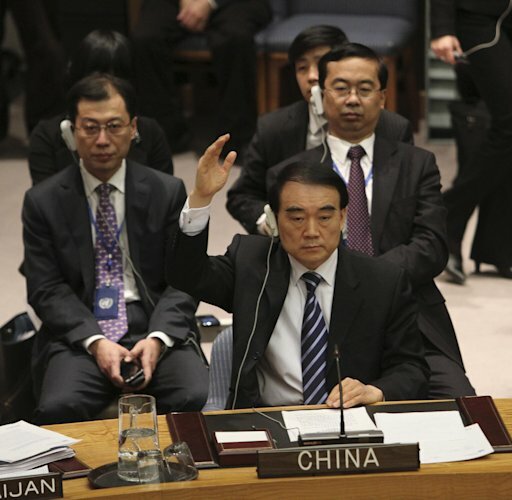 Tell it to the Russia/China pro-Assad veto hand. In the middle of Russia's crocodile tears routine at the UN Security Council Syria debate today was the stunt of announcing a visit by the foreign minister to meet Bashar al-Assad to promote a solution to the crisis -- on Tuesday. At the current 200 people a day death toll, that's 600 more dead people before the meeting even gets started. Is there any chance that the famous Reset button was really a detonator? Mitt Romney says that the full sequence of his comments on poverty and the middle class are more favourable to him than the excerpted "I'm not concerned about the very poor" quote. They're worse. 90-95 percent of the population struggling and no government programs to help them. Really? Credit to Soledad O'Brien, who knew right away she'd heard a gaffe. Deputy Micheál Martin: An cairdiúlacht is precious i mo thuairim. Deputy Gerry Adams: This was at a summit which noted that 23 million people are out of work across the European Union. Bhí an Taoiseach ag imirt an amadáin le Sarkozy [PM was acting the idiot with Sarko] - agus dúirt seisean go raibh an pobal as a gcloigeann. How much extra austerity did the Taoiseach sign up to last night? What extra cuts and tax increases on low and middle income families will be required to meet the new 0.5% deficit ceiling? In his state of the nation - or state of the State - address before the budget, the Taoiseach said, “I want to be the Taoiseach who retrieves Ireland’s economic sovereignty and who leads a Government that will help our country to succeed”. Yet last night he signed an austerity treaty that hands significant new powers over to the European Court of Justice and the European Commission, which are unelected bodies that impose economic policies on democratically elected Governments and which impose heavy fines when they believe these policies have not been adhered to. The Taoiseach also doggedly refuses to give the people their democratic right to have a referendum. How can he talk of restoring sovereignty on the one hand, and at the same deny citizens their democratic right to have a say on this treaty where he gives away more powers to unelected officials in Brussels?